When Can I Shoot A Burglar? Don't wait until someone breaks into your home to think about the right actions to take. If you fire a gun unnecessarily, it could result in jail time. Or what's infinitely worse, firing a gun increases the likelihood of a burglar using violence against you. Before you consider pulling the trigger, it's vital to learn what the U.S. state laws are on gun self-defense. Generally, it is legal to fire your gun if an intruder enters your home and appears capable, or likely, to kill or seriously injure you. The level of danger is based on what you are able to observe at the time, and the law also doesn't expect you to hold your fire if someone points a realistic fake gun at you either. So the question should be answered honestly, and may require split-second decision making. Is there a genuine danger? Even when there appears to be a threat, you could still be charged as a criminal if you react in a disproportionate way. 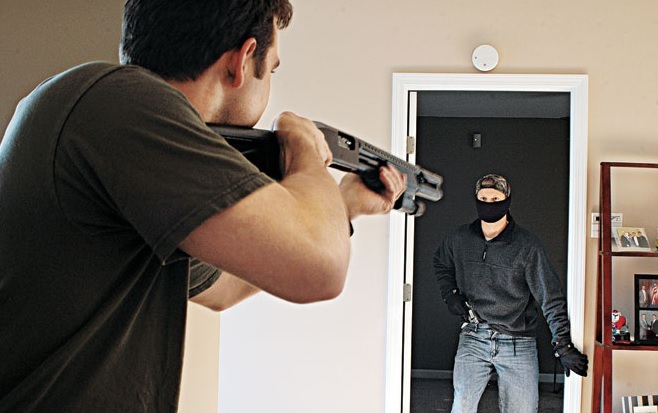 If an unarmed intruder is approaching you, there's a greater justification to use a weapon than if the person is either still searching for valuables, or in the process of leaving your home. The punishment for disproportionate force varies considerably depending on state law. If someone is trying to break into your home and you lethally shoot a burglar through the door, this will most likely be considered a crime in most jurisdictions. The same holds true if you fire at someone who enters your backyard without permission. In most other situations, the legality of using a firearm is different in each state. A number of states have "duty to retreat" laws. When possible, they call for residents to rather try escaping from intruders before shooting them. States with these rules include Ohio, Minnesota, Hawaii, Missouri, Iowa and much of the Northeast. If you live in one of these places, consider carrying an alternative non-lethal weapon, like pepper spray. Sometimes, certain states would rather enforce the "castle doctrine." It generally permits gun owners to injure or kill any intruder who enters a home or business. Many states have this law, including Illinois, Oregon, Washington, and California. However, some of them also enforce the "duty to retreat", but to a lesser degree. A homeowner might still be prosecuted if the use of lethal force was easily avoidable. A similar rule is known as the "stand your ground" law. It authorizes firearm owners to shoot without trying to escape first. However, the shooter must be in genuine danger. Unlike the castle doctrine, this rule applies almost anywhere. It isn't limited to a person's residence or place of business. New Hampshire, Alaska, the Carolinas, Arizona, Nevada, W. Virginia and a number of southern states enforce this law. Unfortunately, it's difficult to carefully assess the legality of using a firearm in such tense circumstances. You certainly don't have time to consult with a lawyer. Though, it's best to try avoiding burglars altogether and get away from them. There are a few steps you can take to survive a home invasion, and most of the time it can be as simple as locking your doors, keeping first-story windows shut and installing a sophisticated home security alarm system.